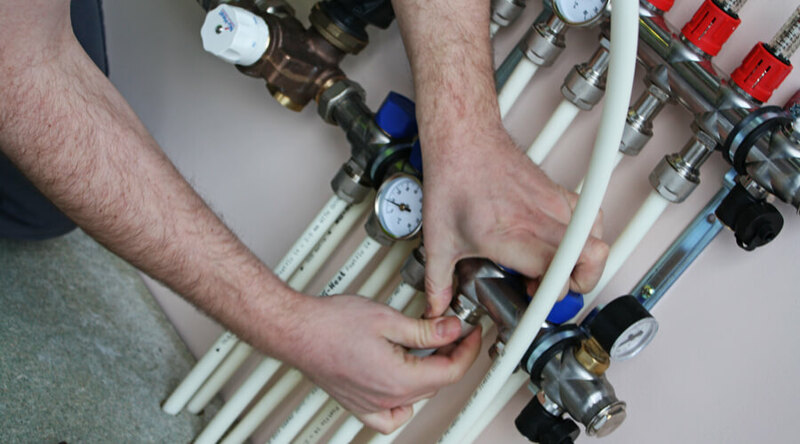 The manifold is the heart of an underfloor heating (UFH) system, distributing warm water to each UFH zone. It feeds water at the correct temperature from either the boiler (via a blending valve) or from the heat pump, and directs it to each UFH tube at the correct flow rate. With UFH it isn’t as simple as just pumping warm water around all the tubes and hoping that everything heats up as required. The flow rate through each coil of tube will be influenced by the heat loss of the zone that it runs through, so the system must be balanced to make sure that the flow is distributed accordingly. The fact that there will be different tube lengths adds to the complexity of the situation. The manifold is made up of between 2-12 ‘ports’ (where the tube connects) and these function in pairs of flow and return. The flow manifold (the top row of the diagram) is fed by the warm water, the temperature of which is shown on the temperature gauge (2). When a zone is calling for heat, the water flow is indicated by flow gauges (1) which show the rate of flow. With Nu-Heat’s manifold the flow gauge also incorporates the setting valve, and adjustment is made by screwing the collar (3) in and out. Water will then flow through the tube, and arrive back at the return manifold. On the return manifold rail there are valves to control whether or not the water will flow through the individual tube. These valves are controlled by actuators (6) which in turn are connected to the thermostat in the heating zone. It is possible that multiple actuators are controlled by one thermostat, if there is more than one coil of tube in that zone. 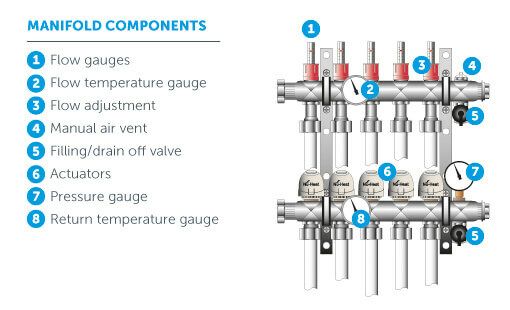 Another temperature gauge is on the return rail (bottom row of the diagram) so that the differential temperature between flow and return can be assessed – useful during commissioning to make sure that everything is working correctly. Each manifold rail also incorporates a filling and drain off valve (5). This is used during installation to flush the pipes through with water to purge all the air from the system. A pressure gauge (7) is found on the return manifold rail, and this is used to assess the pressure during the pressure test. Finally there is a manual air vent (like you would see on most radiators) to allow small amounts of air out of the system. Nu-Heat’s manifolds arrive pre-assembled on the mounting brackets, helping to save on installation time. Because of its innovative blow-moulded stainless steel design, each rail is continuous (as opposed to some others on the market which are modular, and bolt together) meaning that there are as few joints and seals as possible. The only components that have to be added on site are the two temperature gauges, which simply push into pockets. Tip: It can make life easier to remove the return rail from the brackets in order to connect the tube to the flow manifold – this is simply done by undoing two screws. Fixings are supplied for securing the mounting brackets to the wall, and the tube can then be fitted using the connections supplied. Click here to find out more about underfloor heating from Nu-Heat.